I met our neighbor, Tommy, the other night. He had ridden his ATV over to our side of his fence, and after living here three weeks I suppose it was time we were all neighborly and said hello. Jack immediately ran over to him, brandishing a plastic sword and introducing himself as only a six-year-old ninja can. Matt and I followed along behind. 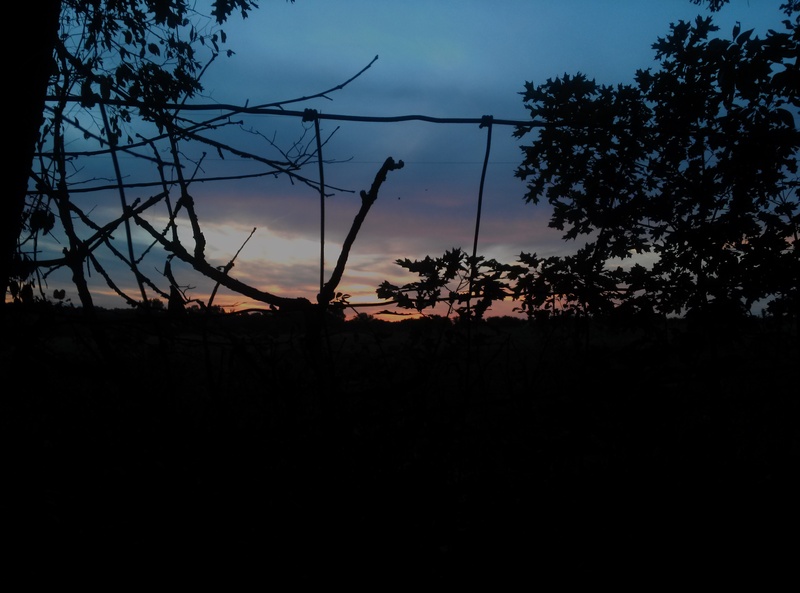 When we caught up with Jack and Tommy, we discovered that Tommy was fixing, it turns out, something I had never noticed before—a thin, silver wire running along the barbed wire that squares off our property from his. In the three weeks that we have lived here, my children, Amélie and Jack, have stood at that fence and fed apples to the horses. My puppy, Luke, has scars to prove that he often slips under the barbed wire to warily introduce himself to the neighbor’s grazing horses and (seemingly) docile bull. I never noticed that “one of these wires is not like the others”—and that we are half surrounded by an electric fence. The thing is, life hasn’t necessarily been peaceful since we moved here. Last Thursday I sat in a courtroom, again, as my dear, dear friend fought for the right to protect her son from a vengeful and menacing father. 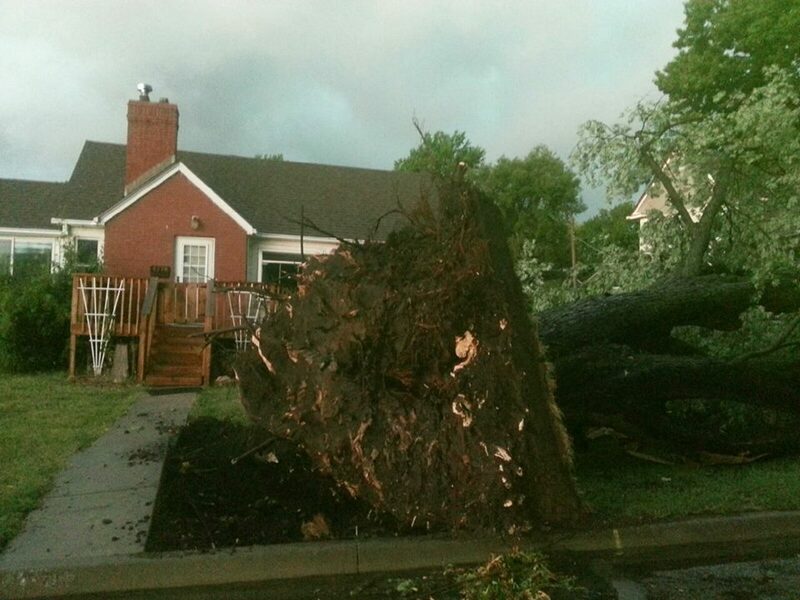 Also, last Thursday a 100-year-old tree crashed to the ground at the house we just moved from (and that we are planning to rent). The damage was so much less than it could have been, but instead of plowing through the piles of boxes in my basement, I was hauling logs of wood onto a trailer and then stacking them up against my house as insurance against the winter cold. Also, I was sort of attached to that tree, and I was achingly sad to see its deep roots exposed to those who drove by to shoot cell phone pictures and to see its dignified height splayed all over my yard. When we lived in that house my kids swung almost daily from a wooden swing hanging from a high branch in that tree. 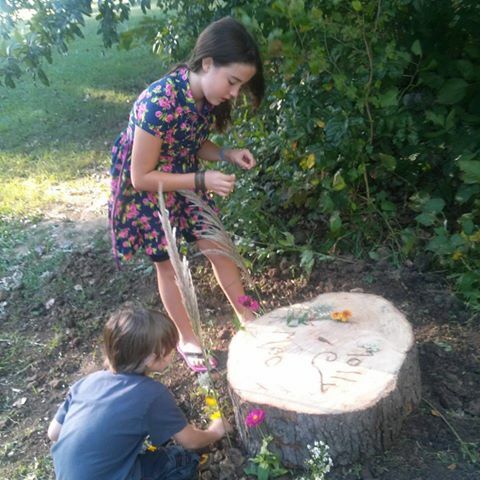 We fed the squirrels who called that tree home. Matt and I would sit on our deck at night and listen to its leaves whispering secrets in the wind. Then, on Monday, our thirteen-year-old weimaraner, Molly, died. She was old. Her eyes were asking us to let her go, but our hearts crumbled into tiny pieces as we sat with her under the shade of a tree and held her and pet her and let her peacefully slip away. It’s not been a piece of cake, exactly, since we moved here. 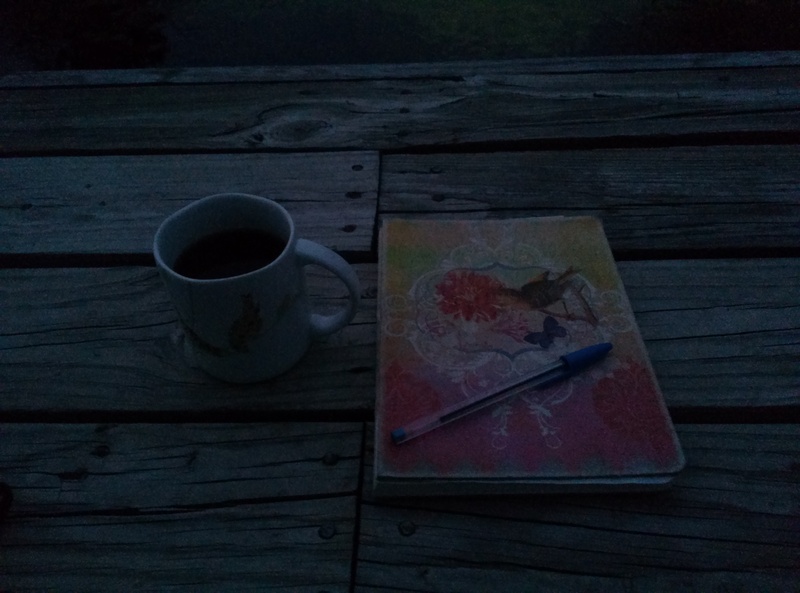 But most mornings I wake up early enough to sit on my little dock, overlooking my very green pond, while cupping a warm mug of coffee in my hands and watching the sun peek over the horizon, the mist rise off of the pond, and the frogs plopping about hunting for breakfast in the algae. 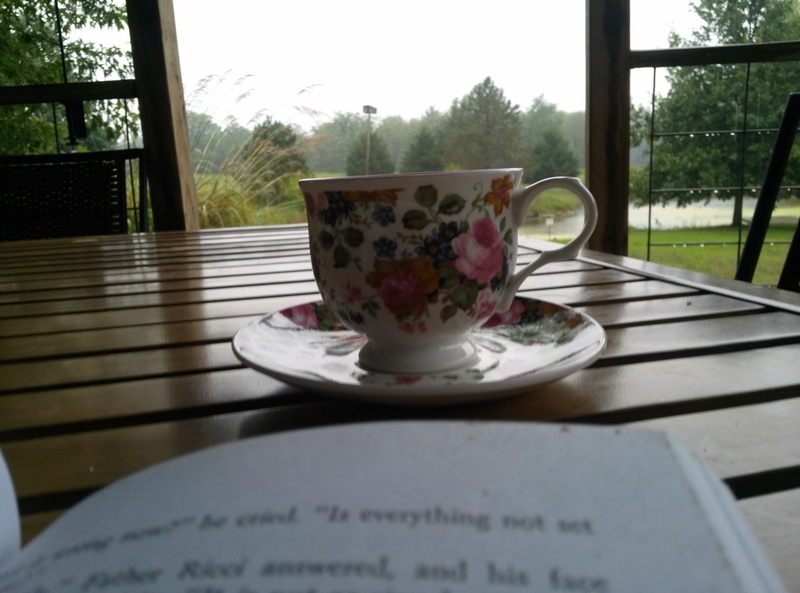 Often, Amélie and I make a pot of tea and sit on our porch to do school. 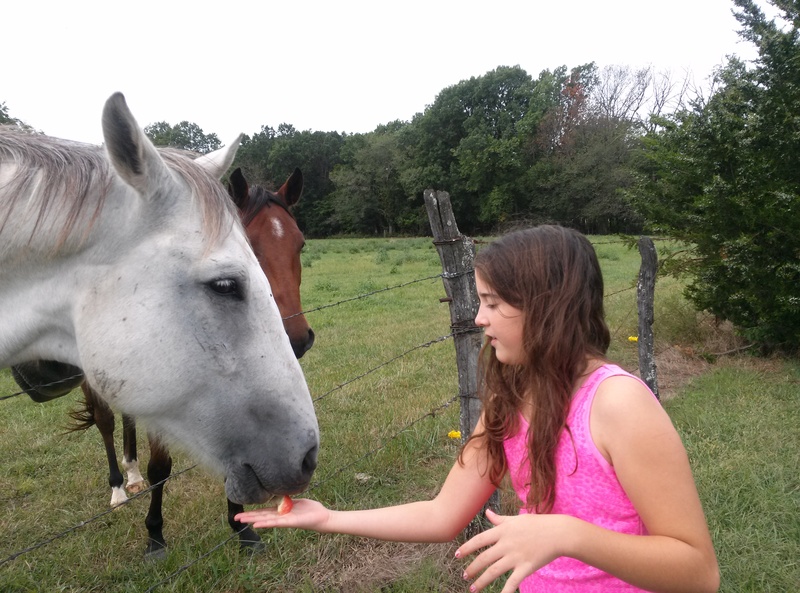 Many evenings I watch my kids pet the horses, jump on our trampoline, and explore the grass and the pond and the trees. And then, after they go to bed, sometimes Matt and I hold hands and walk outside and stare up at the vast, magnificent sky. It’s peaceful here. I love it. I feel safe. Or, at least, I felt safe, until I discovered I was hemmed in by a fence that could stop a heart. Matt swears to me that Tommy is talking like a cowboy, and that he doesn’t mean that the fence could literally stop a heart. I’m trying, but I just don’t believe him. And really, that electric fence is a metaphor for the way I usually live my life. I always feel like I am surrounded by an electric fence. Even on my best, happiest days, there is that fear lurking in the back of my head—that terror—that something around me could “stop a heart.” There is always a shadow lurking around my joy. There is always fear. Fear that a deer will dash in front of me as I drive down my country road. Fear that an innocent cough will herald doom. Fear that my children or dog will be electrocuted by an electric fence. Today, as I was driving, I reminded myself that this is not how I was created to live. I wasn’t created to live in fear. I wasn’t created to live a life surrounded by an electric fence. I can’t change the fact that my neighbor has an electric fence humming around the edges of my property (which, I might add, keeps out of my yard the probably not-so-docile bull). But I can unplug the electric fence of fear that surrounds my own heart. I won’t let fear stop my heart from loving my children and husband and life with abandon. I won’t let fear stop my heart from pursuing my dream of writing. I won’t let fear stop my heart from gazing with pure joy at the rising mist, the waxing moon, or my children running barefoot in the dewy grass. God promises me—God promises you—an abundant life, a full life, a joyful life free from the electric hum of fear. Please, at least for today, let’s choose to live in the open space of what starts our heart, rather than in the thin, buzzing wire that could stop it. Just for today, don’t let fear stop your heart, and I won’t let fear stop mine. Tags: abundant life, children, faith, family, fear, Jesus, John 10:10, kids, parenting. Bookmark the permalink. Previous post ← Protect or Prepare?